Celebrating over 30 years, TIC has been the premier technology/sports day camp in the DC area. Kids learn by having fun with superb technology instruction and athletics, a 4:1 teaching ratio, unique projects created with real programming languages or multimedia software. Kids come to explore technology, and receive personal attention, excitement and creativity rarely found elsewhere. Our half day sports program offers a physical challenge to balance the mental stimulation of technology. Now with 3 convenient locations! 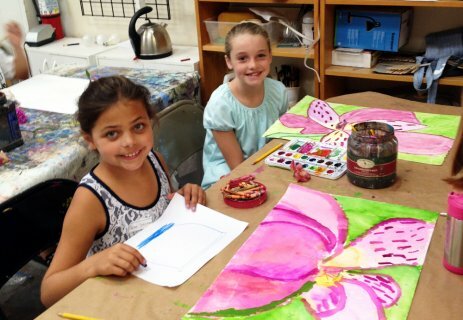 A 4-week and 2-week multi-arts summer day camp for young people on the campus of Georgetown Visitation Preparatory School. Immerses campers in theater, music, visual arts, dance, and media. The Theatre Lab's summer camps are fun, high-energy programs that allow young people to fully engage their imaginations as they experience the thrill of creating live theatre. From learning the basic techniques of acting for the stage, to developing improvisation and physical comedy skills, to putting it all together in a public performance, it's a summer your child will never forget. Before and aftercare available. Cost for 1 week (June only): $310. Join Broadway artists, university faculty and enthusiastic musical theater students from all over the country in a 6-day intensive training academy. Students ages 12-18 live on Georgetown University campus while participating in the program. The Musical Theater program offers daily workshops in the three essential components of musical theater - acting, singing and dancing. Curriculum will include improvisation, scene study, vocal instruction, audition techniques and dance workshops for all levels - from beginner to advanced. What are some Amateur photography workshops in Washington dc? What is the average summer temperature in Washington DC? The average summer temperature in Washington, DC is 57 - 89 degrees Fahrenheit. This takes the three summer months July to September into account. All other months neglected.